On a distant planet, in a blinding flash of light, the body of a naked man appears lying amid ancient ruins inhabited by wandering nomads. 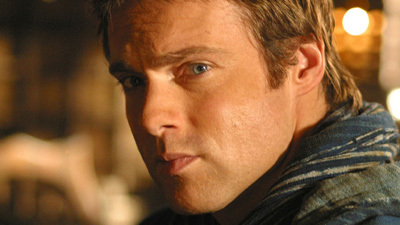 It is Daniel Jackson, but he has no memory of his identity or his past. Meanwhile, on Earth, Jonas believes that the Ancient tablet recovered from Abydos points to a planet called Vis Uban as the location of the Lost City of the Ancients for which they have been searching. SG-1 journeys to the planet, and finds instead the ancient ruins and nomadic tribe that had taken in Daniel Jackson as one of their own. Reunited with his teammates, Daniel hesitantly agrees to return to Earth. He has no memory of his life as an ascended being, but he may have been expelled by the Others and returned to human form for interfering in the battle against Anubis. Once on Earth, memories of his life before his ascension slowly begin to return, and he assists SG-1 in their plan to lure Anubis to Vis Uban in order to destroy his superweapon. Daniel and Jonas ring aboard Anubis's mothership to relay coordinates to O'Neill and Carter, who prepare to pilot an F-302 to destroy the weapon's ventilation shaft. Teal'c approaches Lord Yu, who agrees to bring the full force of the System Lords against Anubis, but Yu's mind is failing, and as O'Neill and Carter engage Anubis's death gliders, Yu turns his fleet away and takes Teal'c into custody. Left to face Anubis alone, O'Neill and Carter use a subspace window to penetrate his defensive shields and target the ventilation shaft, forcing Anubis to power down his superweapon. Daniel and Jonas attempt to make their escape from the ship, but Jonas is captured by Anubis, who displays the spiked mind probe he will use to acquire Jonas's knowledge. Daniel is given the name Arrom, meaning "Naked One." Jonas theorized that the Lost City was the City of the Lost, possibly Vis Uban, an Ancient city which was still under construction when the plague broke out that wiped out the Ancients. However, his translation of "Lacun" as "of the lost" was in error. Vis Uban translates as "Place of Great Power." SG-1 visited the last of the planets entered into the computer by O’Neill using the knowledge of the Ancients, believing it may be Vis Uban, later designated P4T-3G6. The Lost City may have been hidden by the Ancients who made it lost to other people that might try to find it, probably by using camouflage and removing all reference to it from written history. Anubis’s superweapon is what gives him a clear advantage over the rest of the Goa’uld motherships. He is quickly decimating the forces of the remaining System Lords, and is in a position to dominate the galaxy. Yu pledged to bring the full force of the remaining System Lords’ fleet against Anubis, but he instead diverted the fleet to Chodawa. The X-302 is now referred to as F-302 (Fighter-302). It can use the naquadria powered subspace engines only in short controlled bursts. It can be disassembled, sent through the stargate, and reassembled on the other side. The code name for the F-302 mission is Air Strike. Both General Hammond and Technician Davis go off-world. Hey, I thought we were going with "Red Leader" on this one. No, but he plays one on TV.